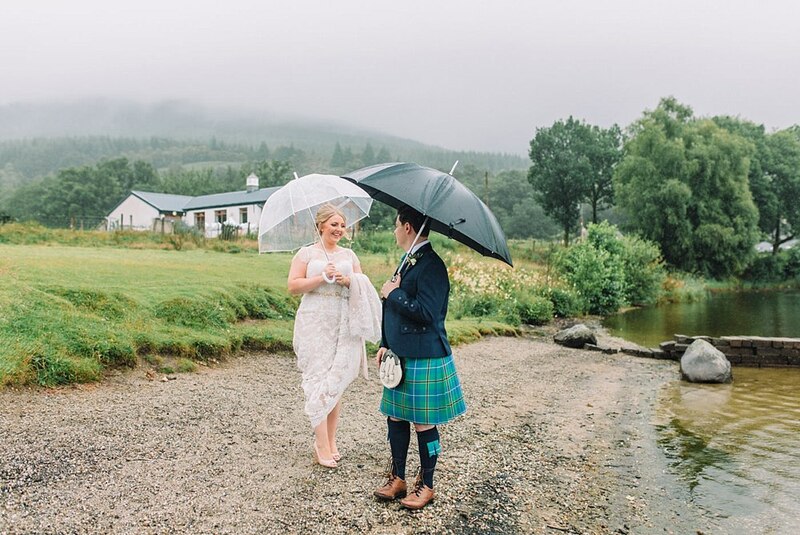 What do you do when it rains on your wedding day? 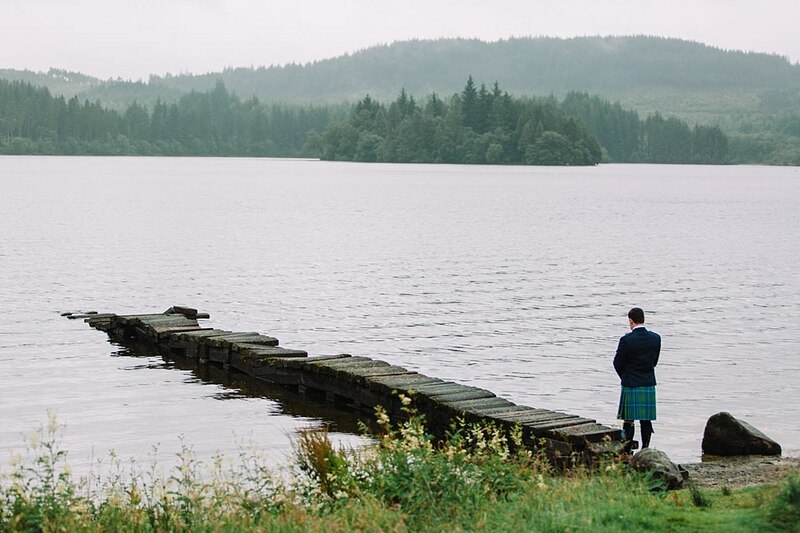 Well, you can’t do anything about it so turn that frown upside down and get on with enjoying your day. 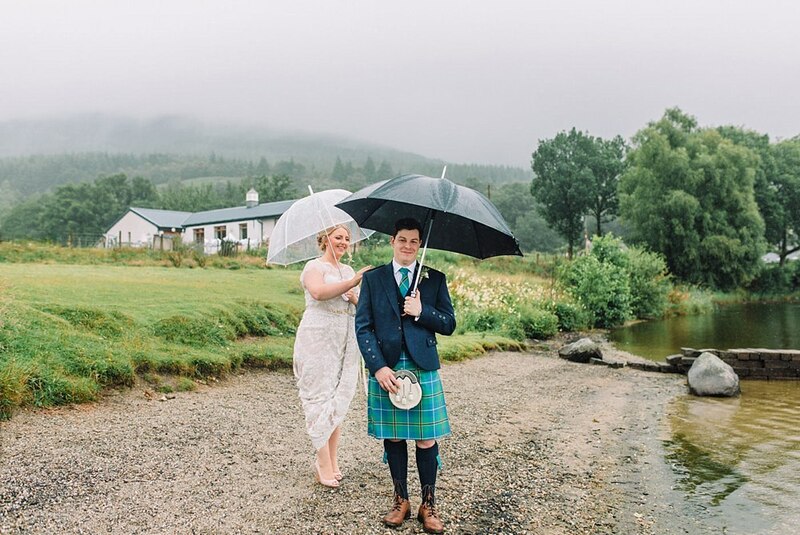 This is exactly what Katharine and Stuart did which was a far cry from the sunny engagement shoot we did for them in Fintry Loop. 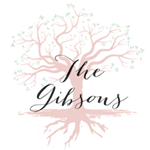 Have a look at it here! 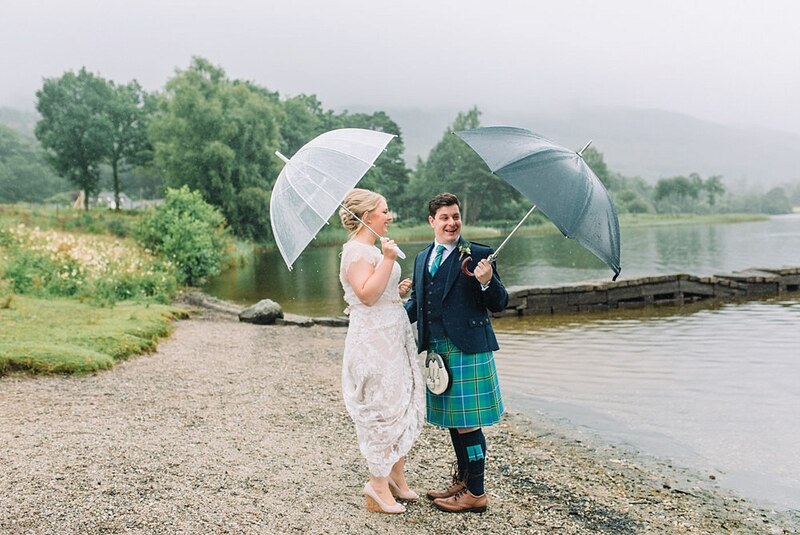 As mentioned above rain is not uncommon in Scotland but First Looks are not a common thing just yet. 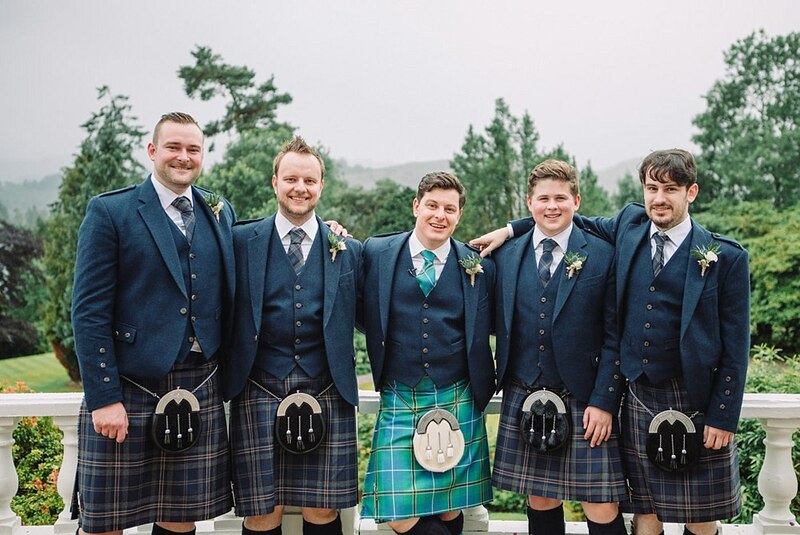 They are becoming more of a thing though and we would highly recommend them. 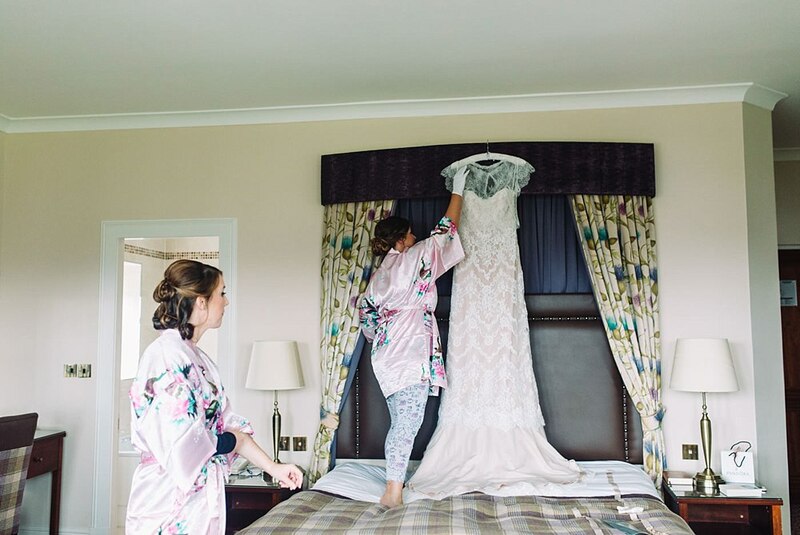 It is when you see each other before the ceremony which can be incredibly romantic and private as well if you are someone who doesn’t like the pressure of having all eyes on you. 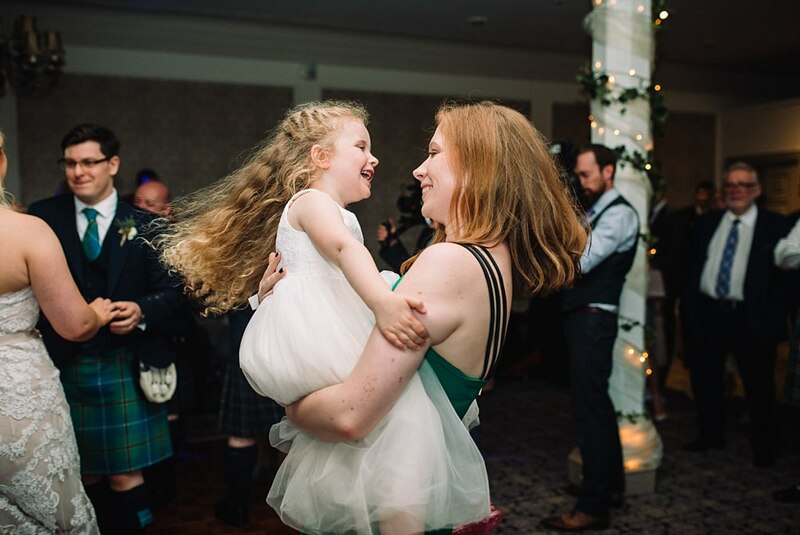 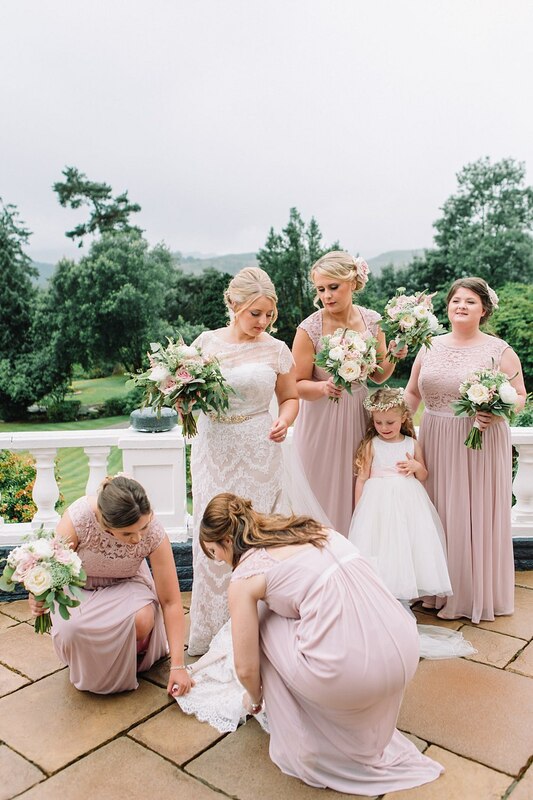 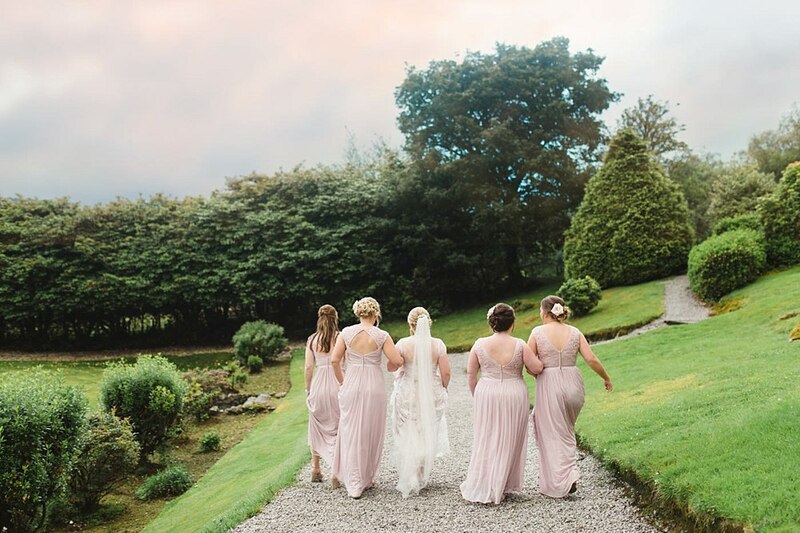 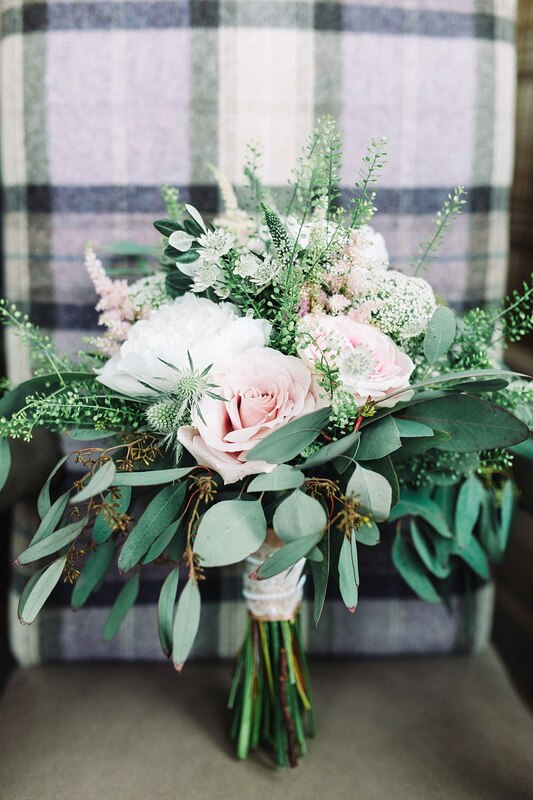 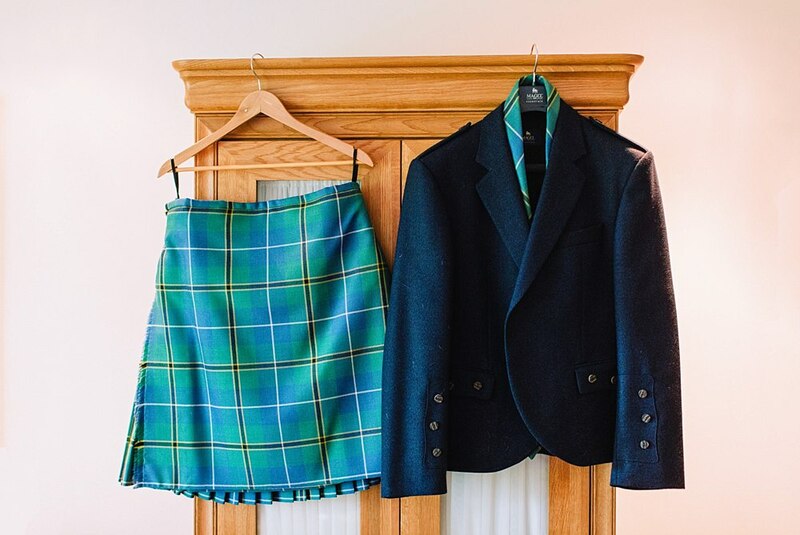 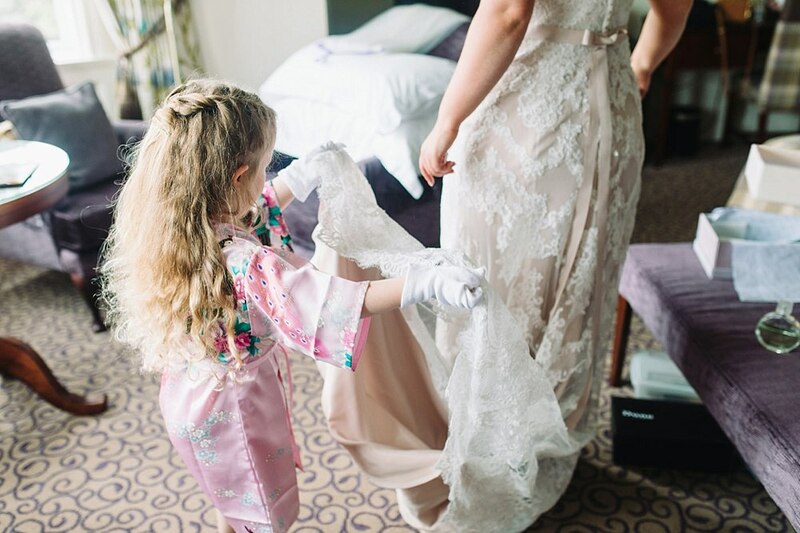 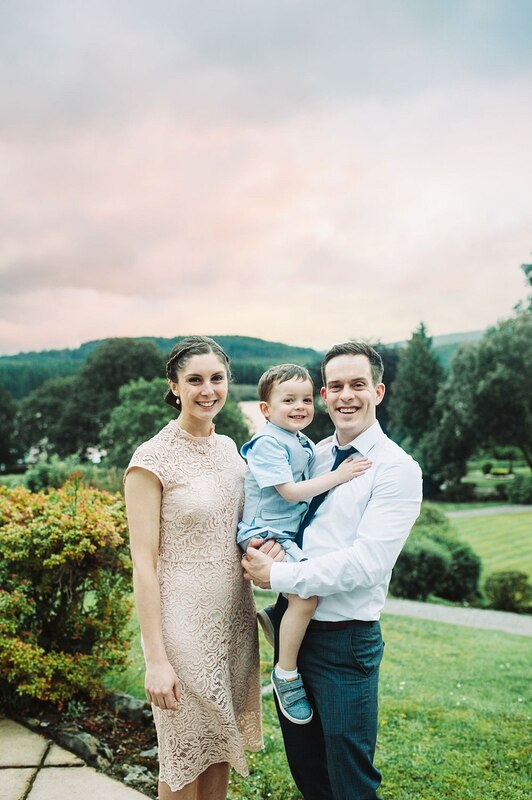 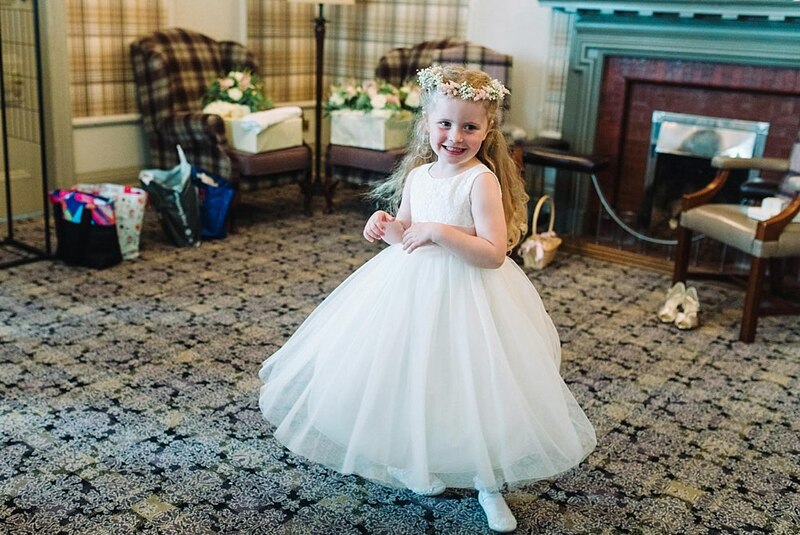 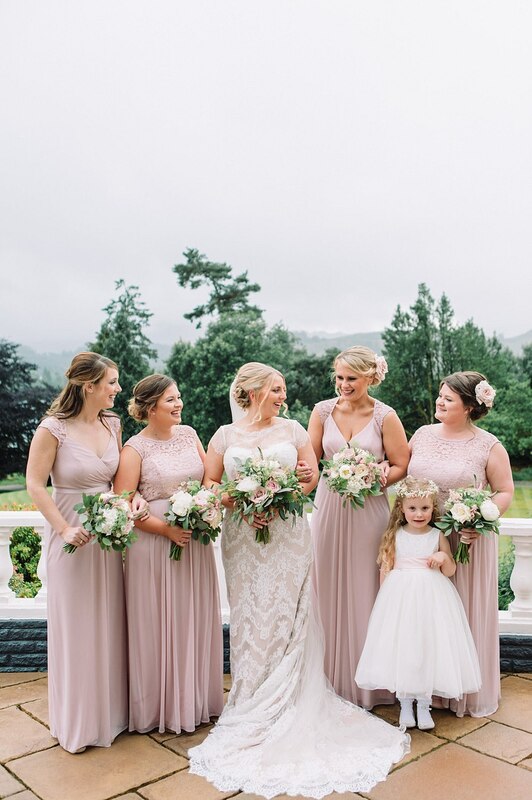 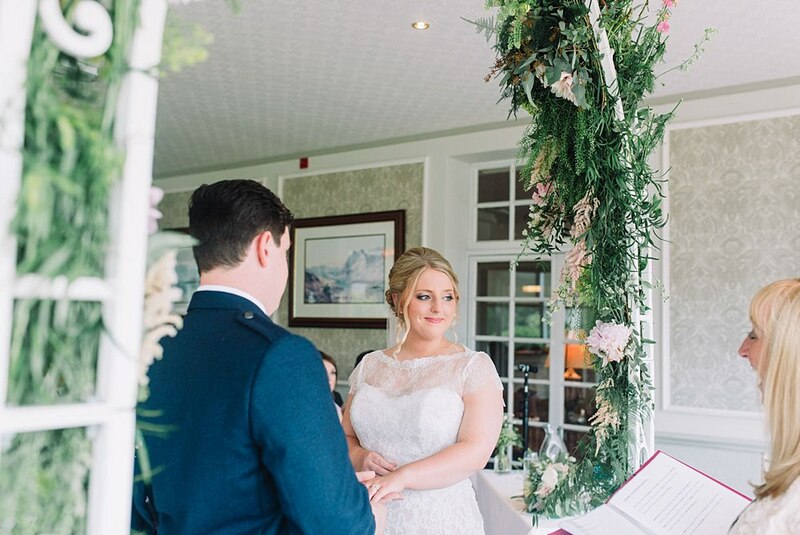 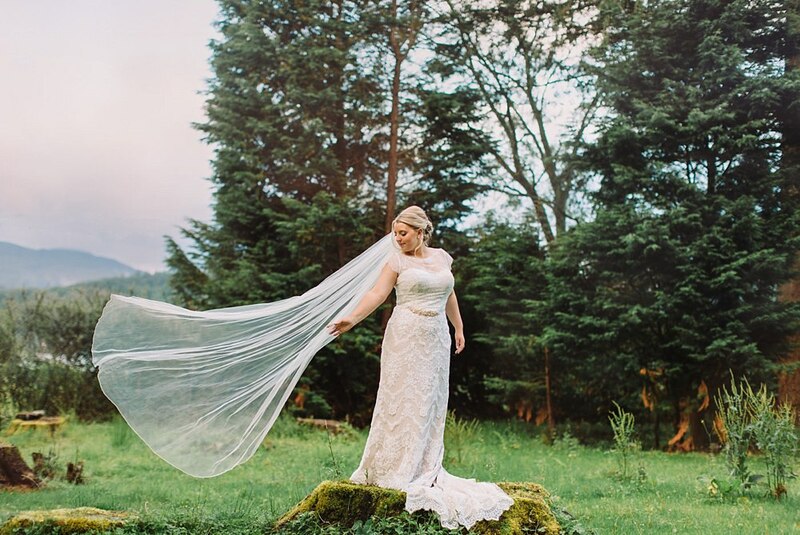 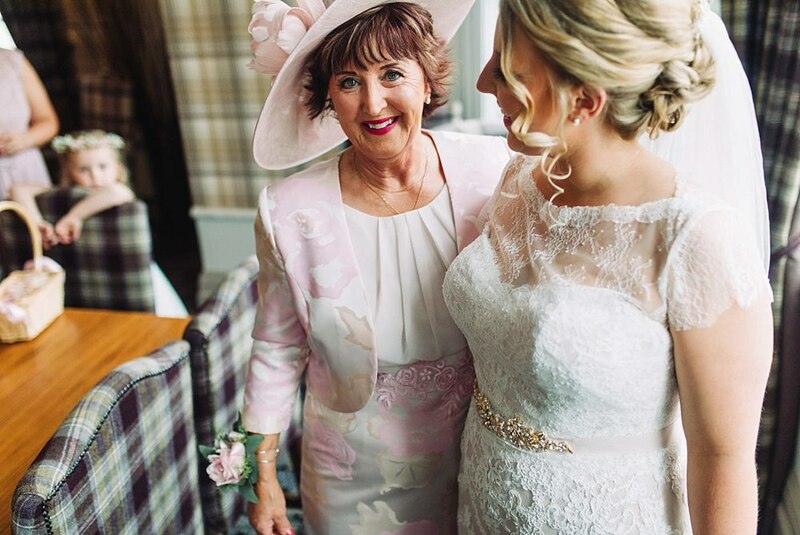 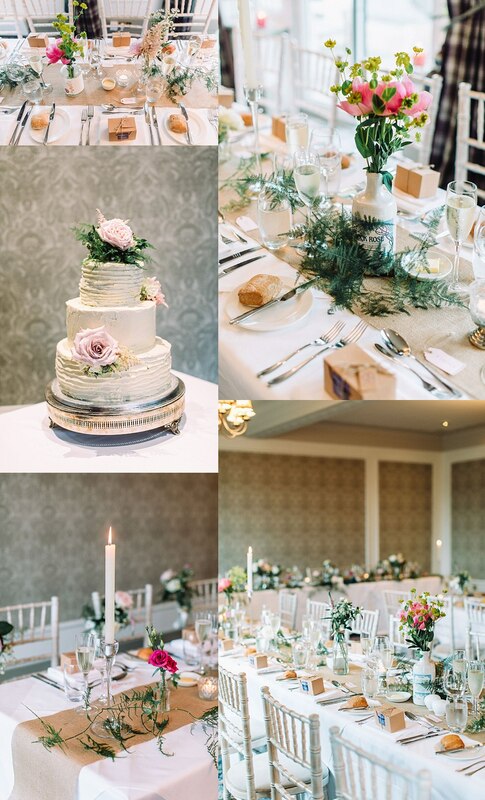 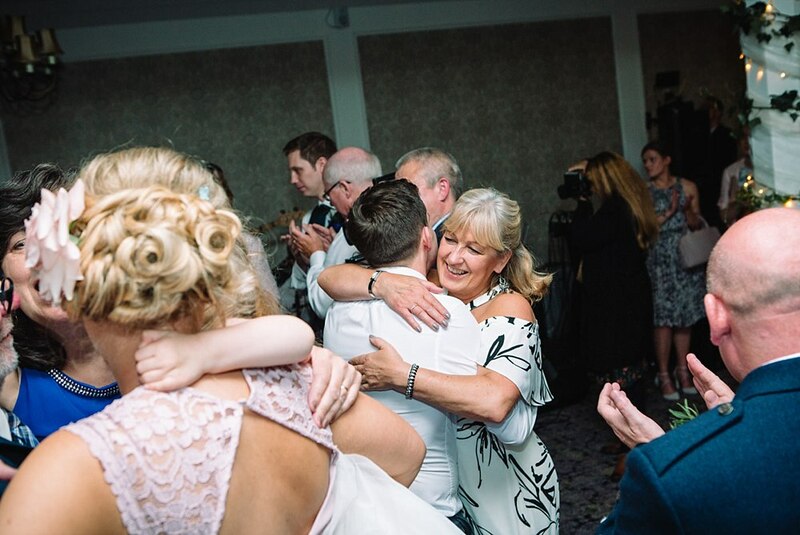 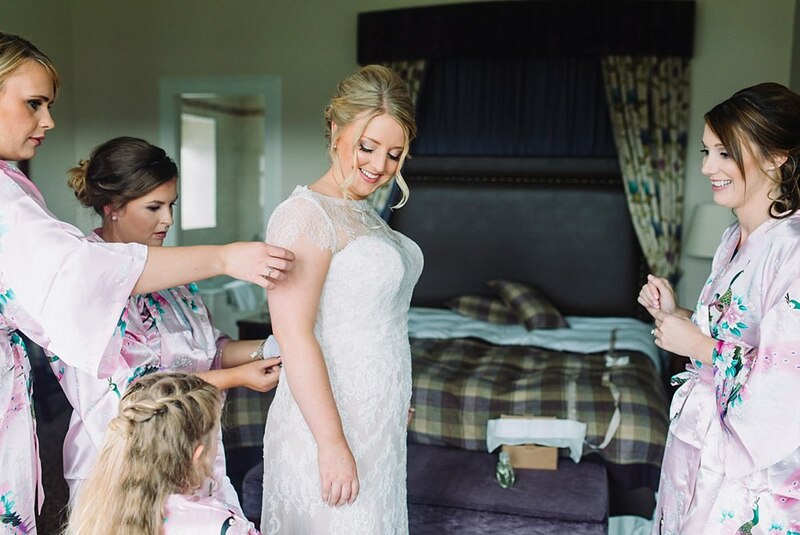 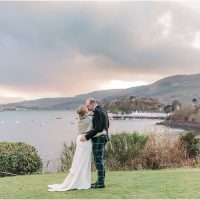 We have written up some top tips on why we love a first look in a separate blog post which you can have a peek at here. 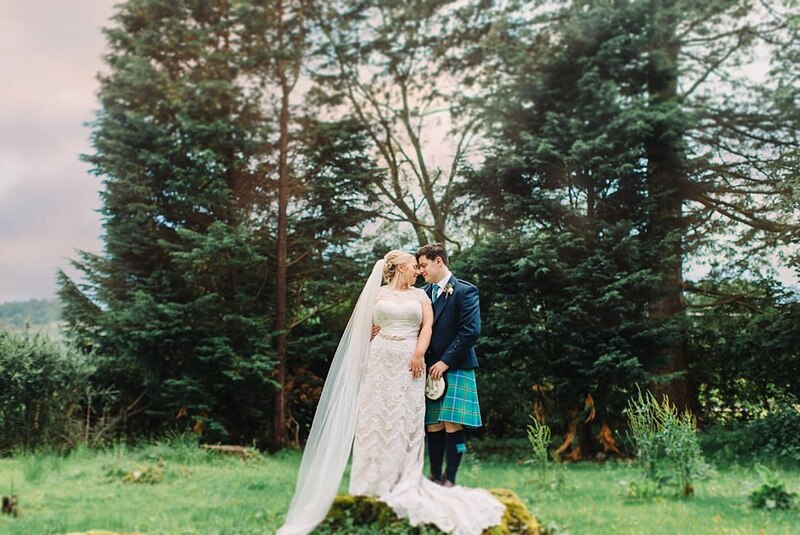 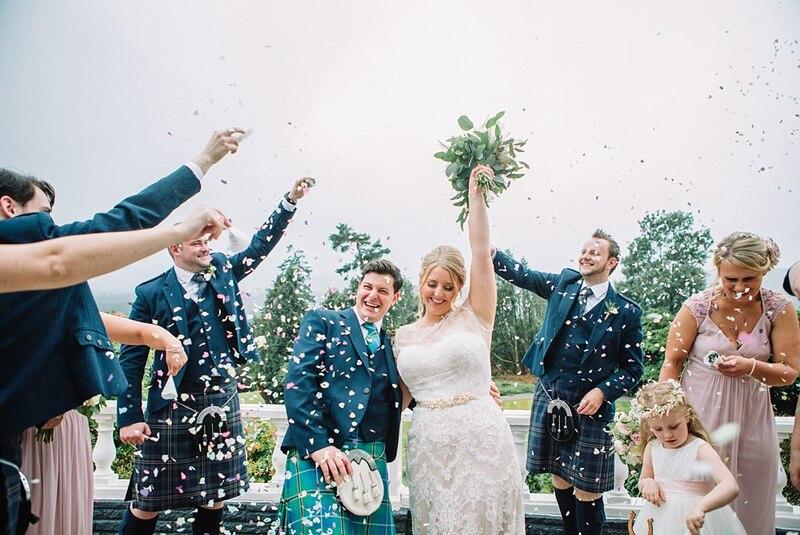 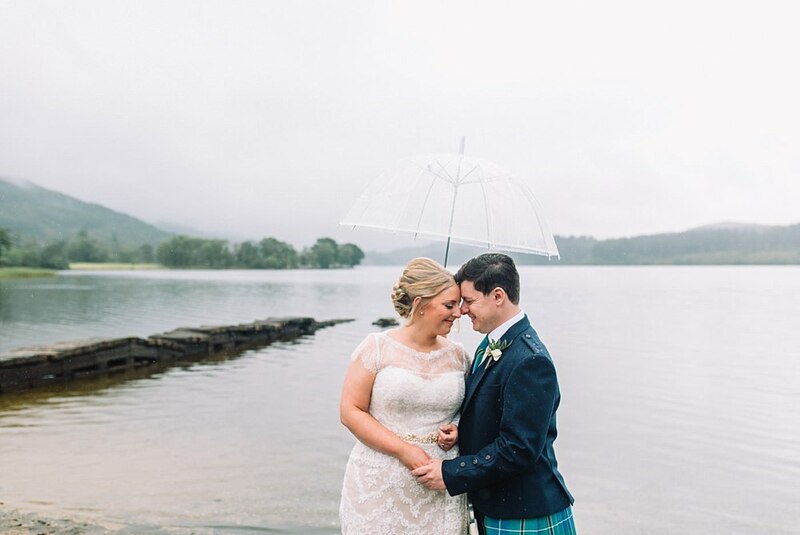 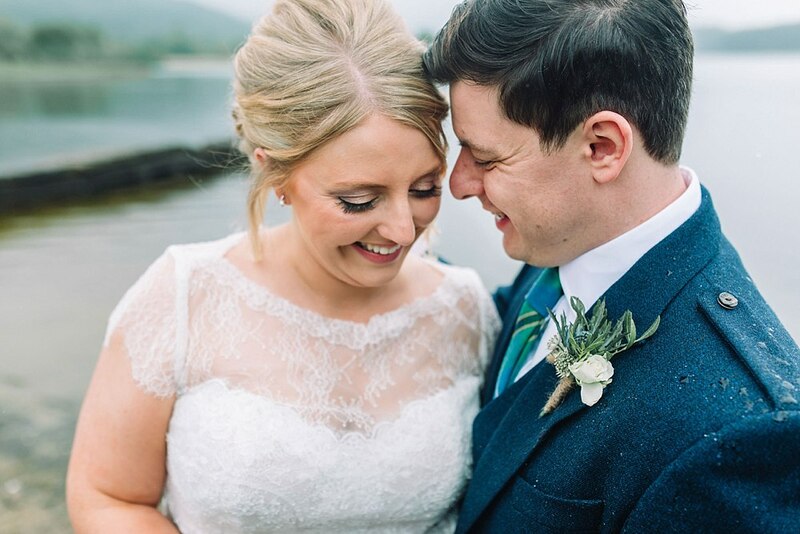 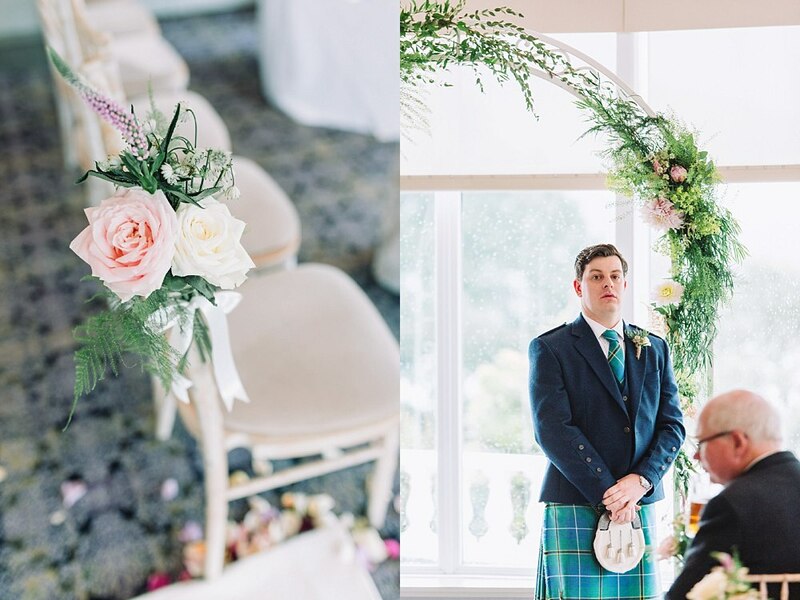 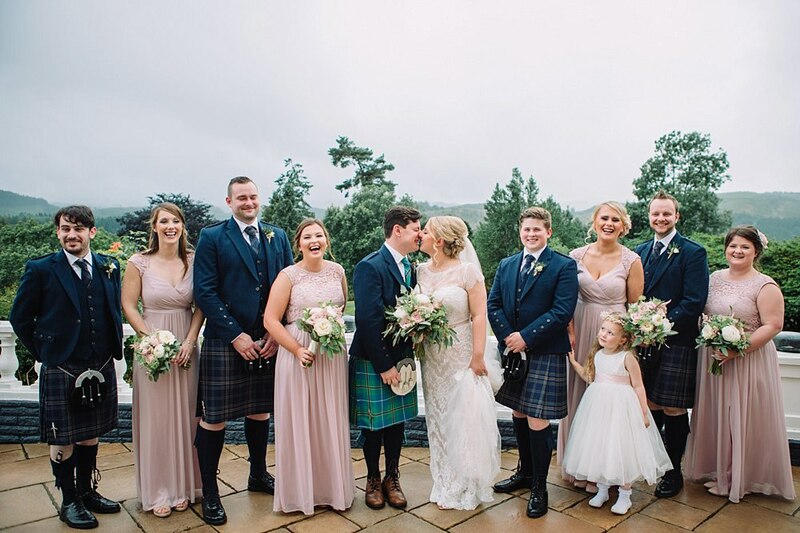 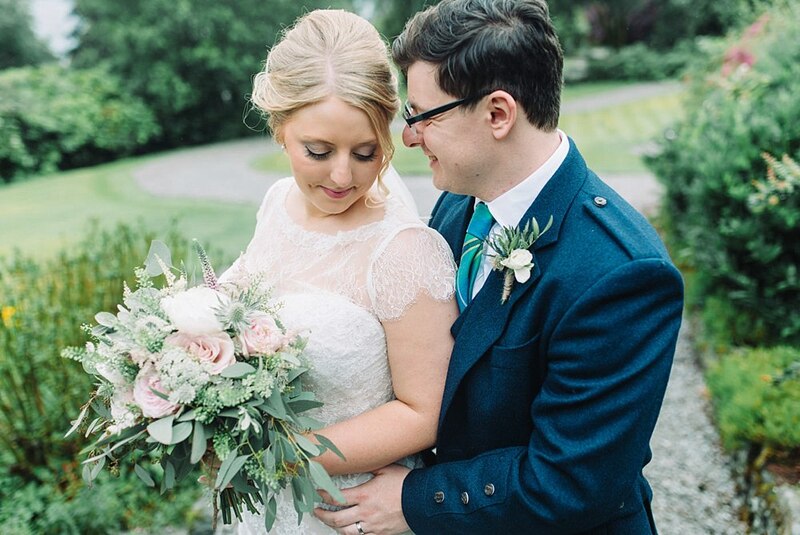 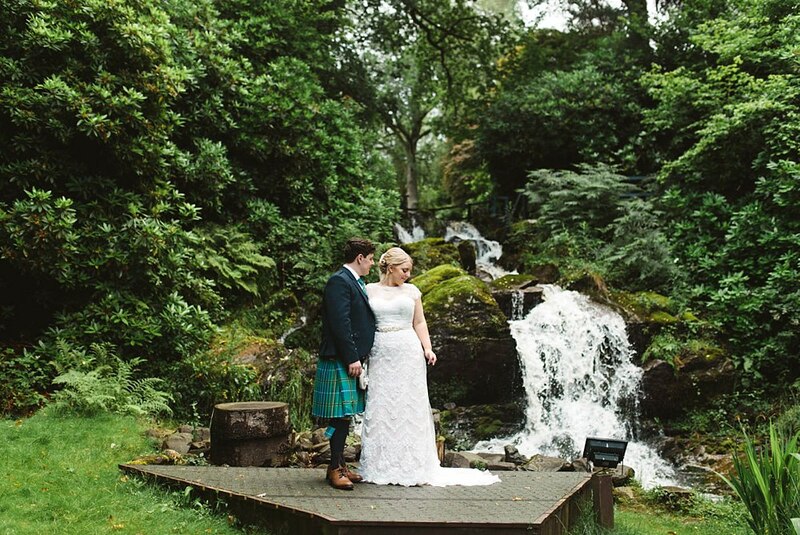 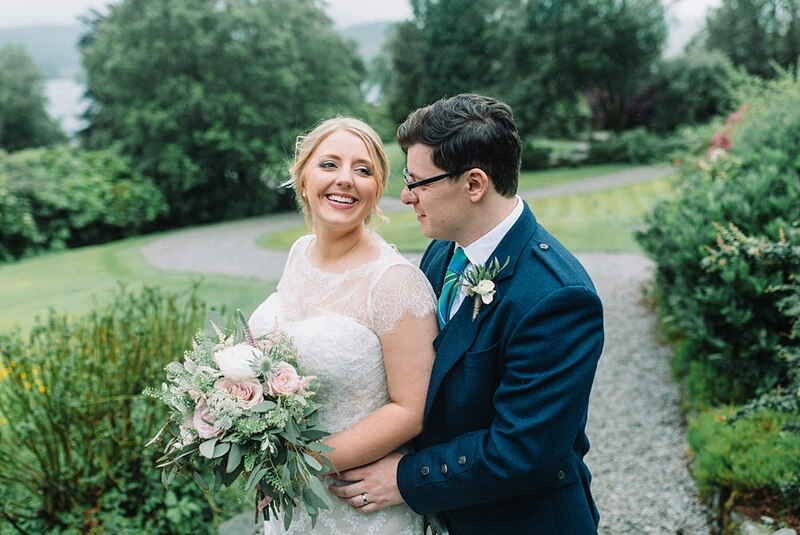 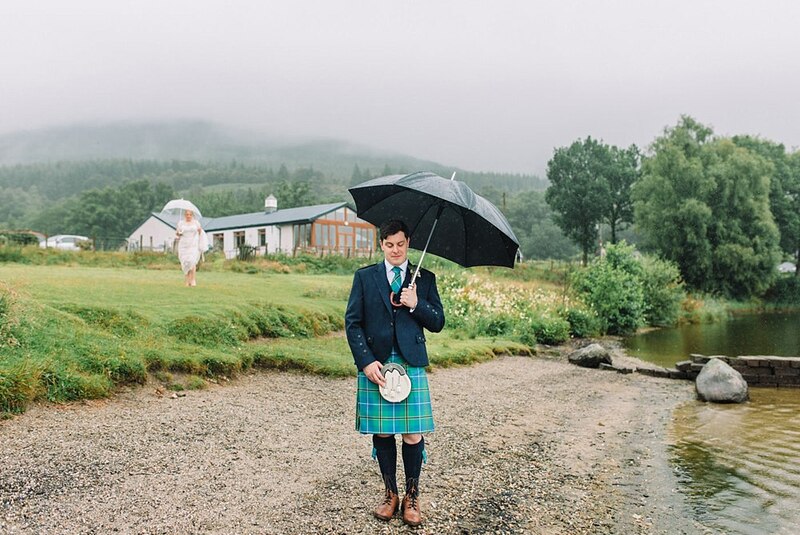 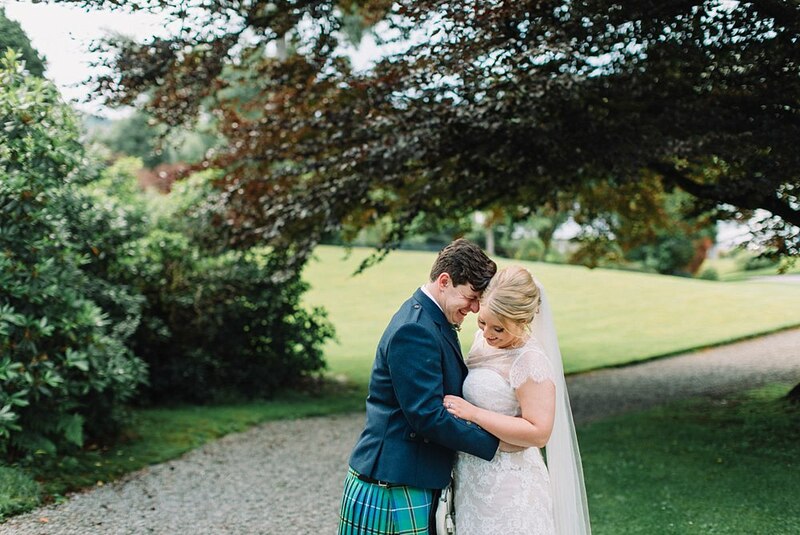 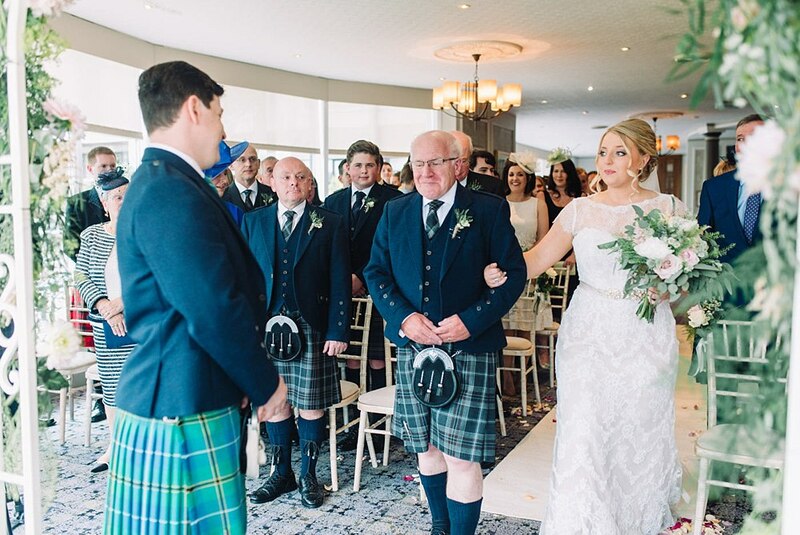 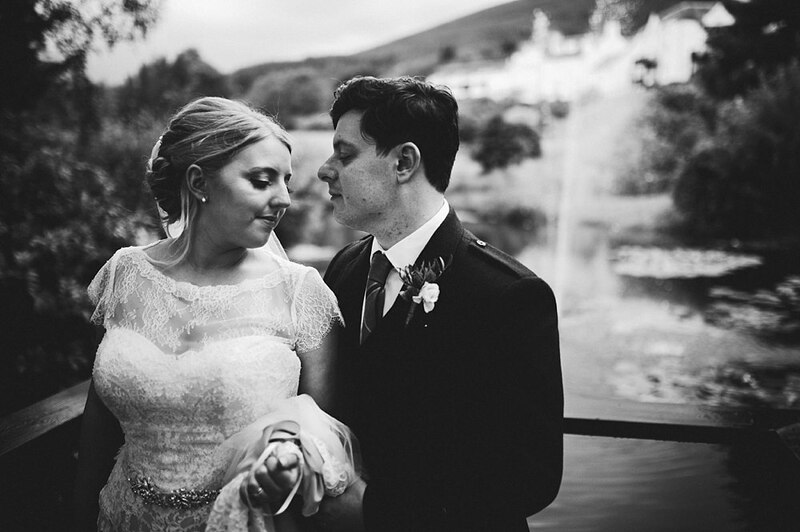 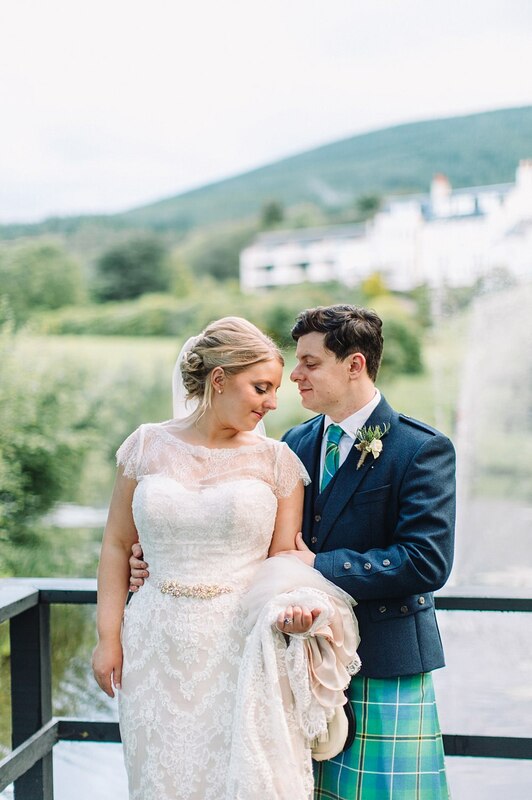 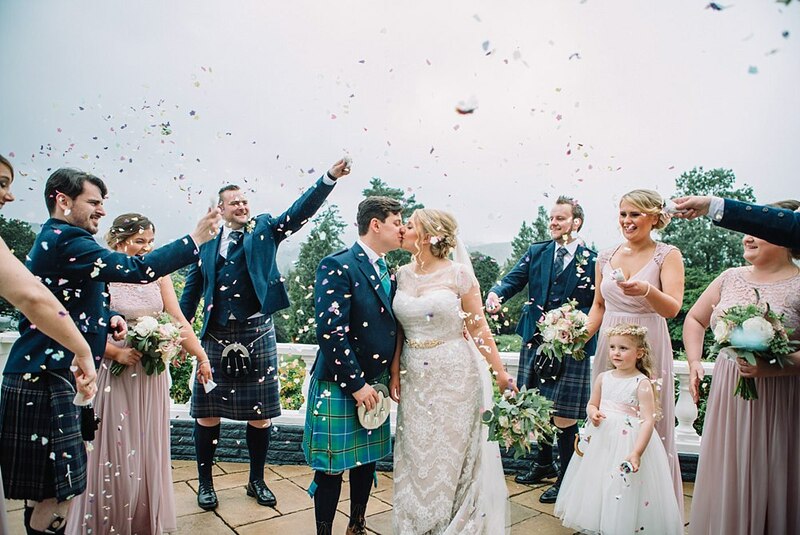 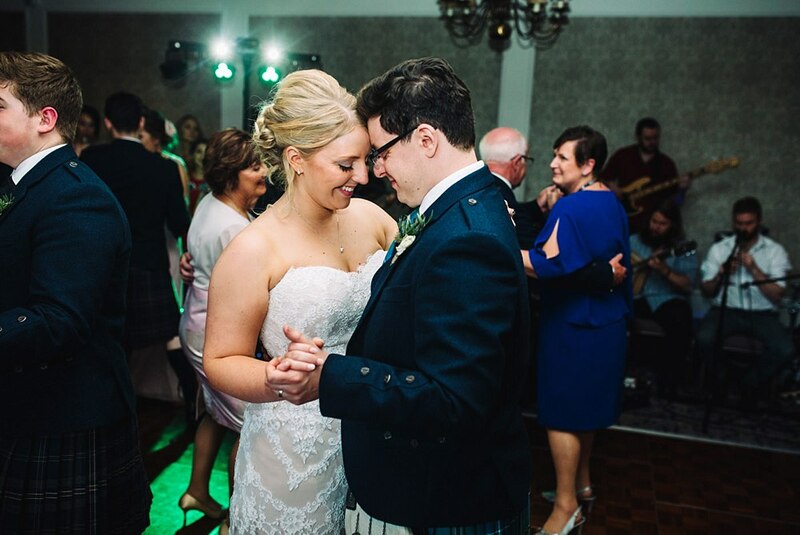 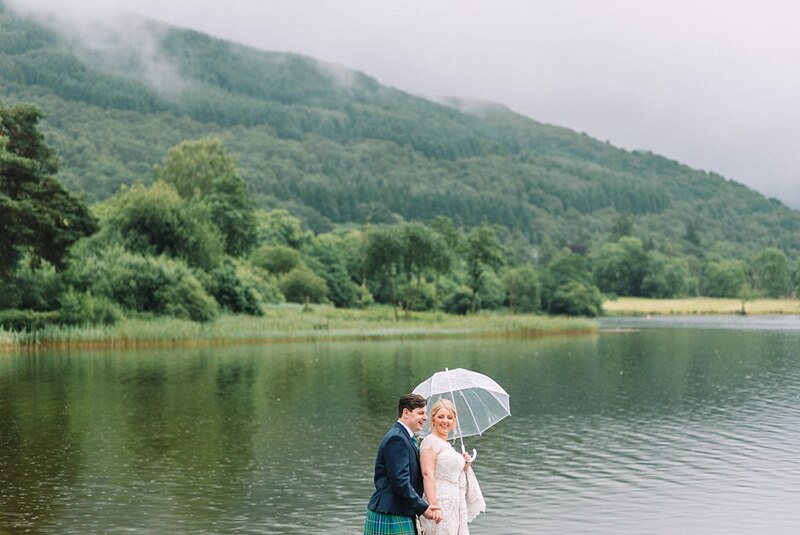 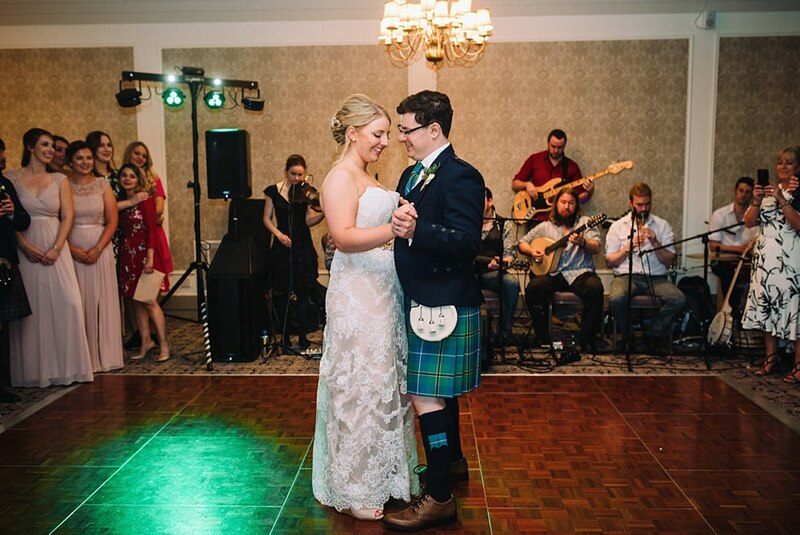 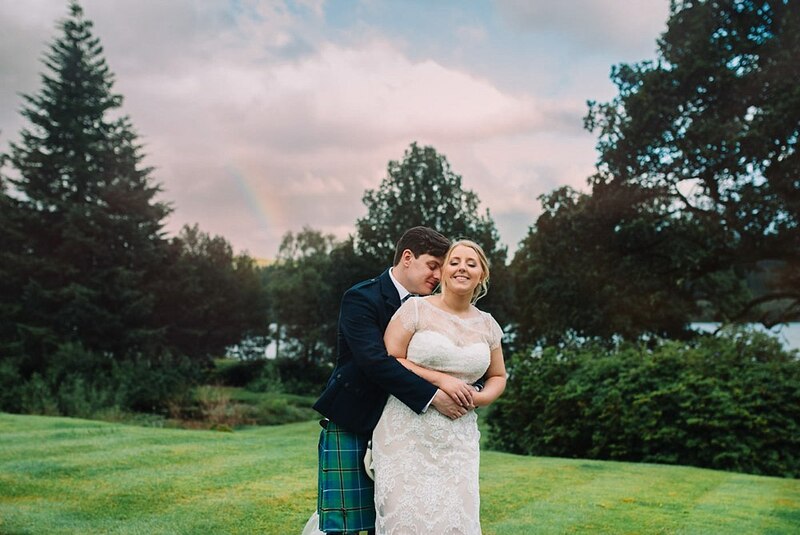 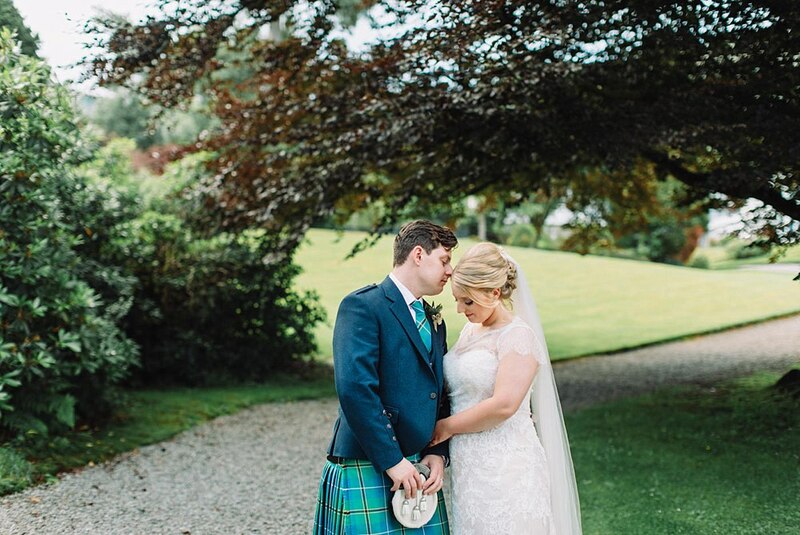 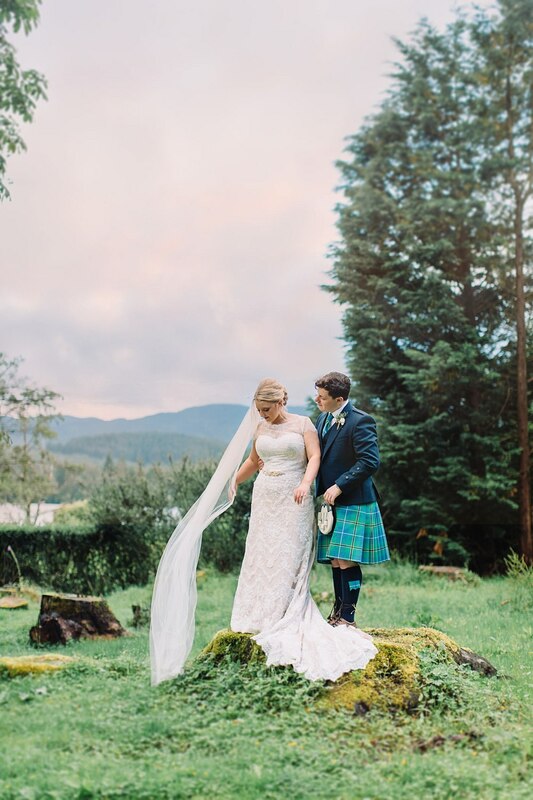 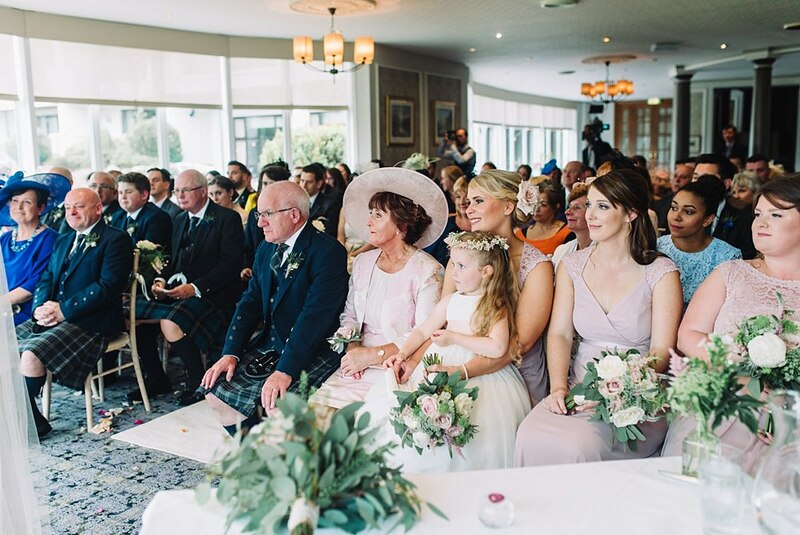 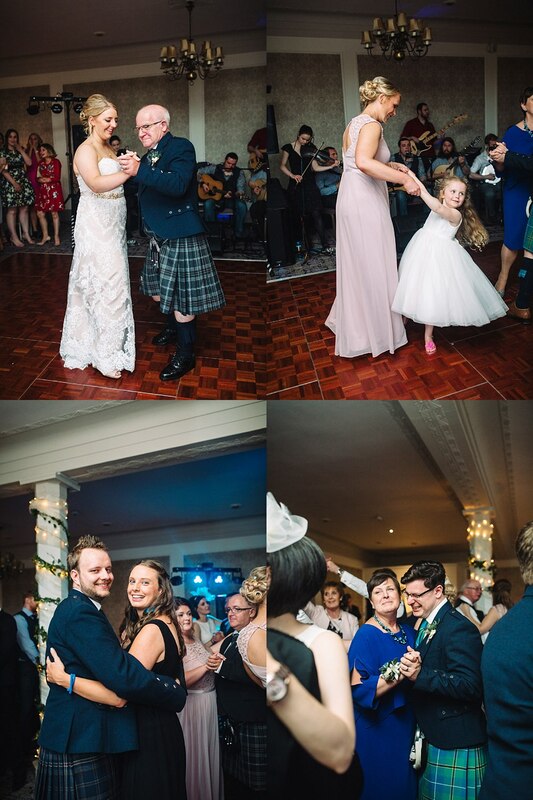 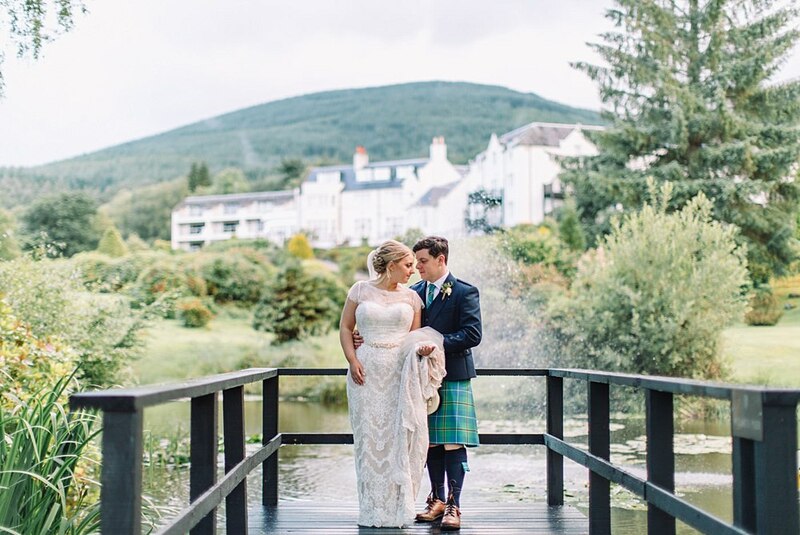 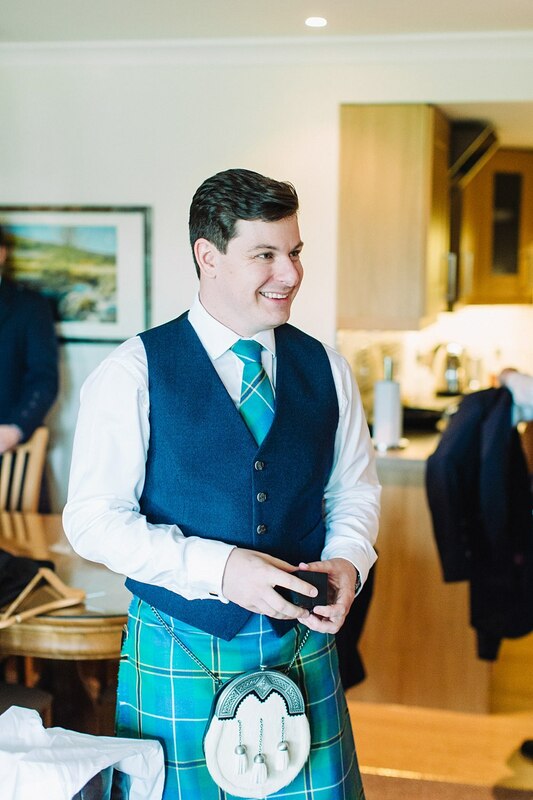 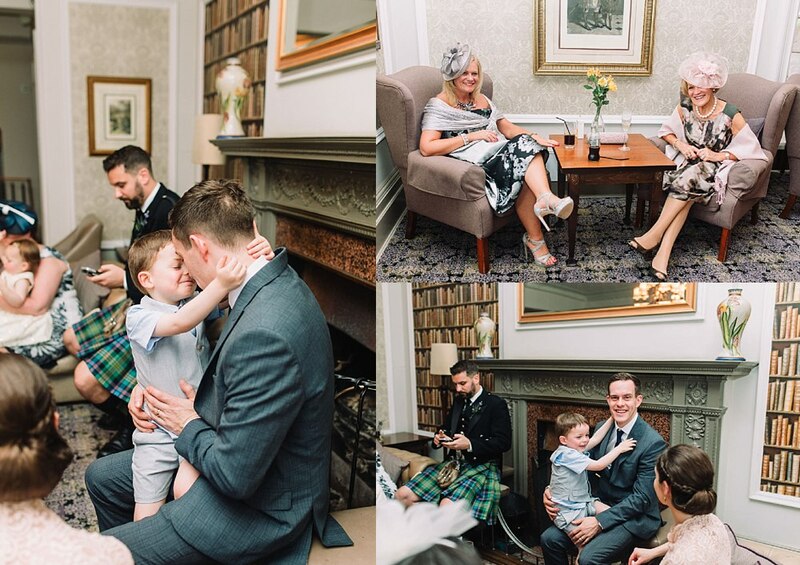 Katharine and Stuart’s first look was nothing short of sweet and memorable for them despite the rain and you know what it made them very atmospheric and truly Scottish. 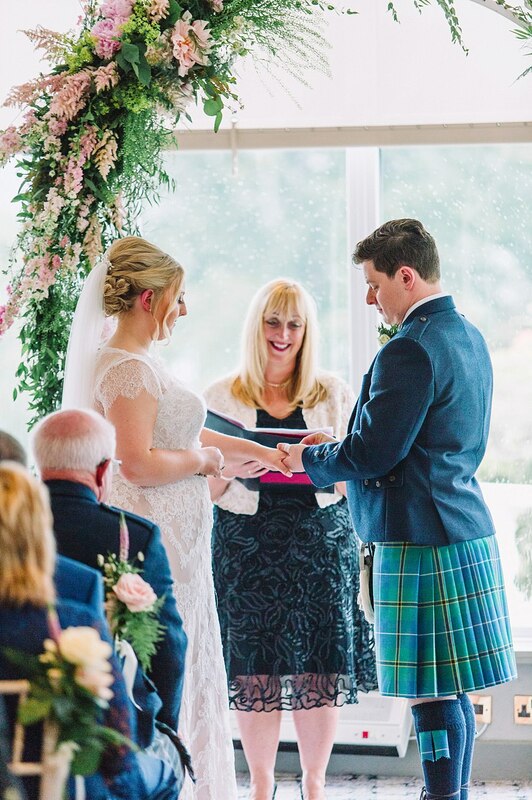 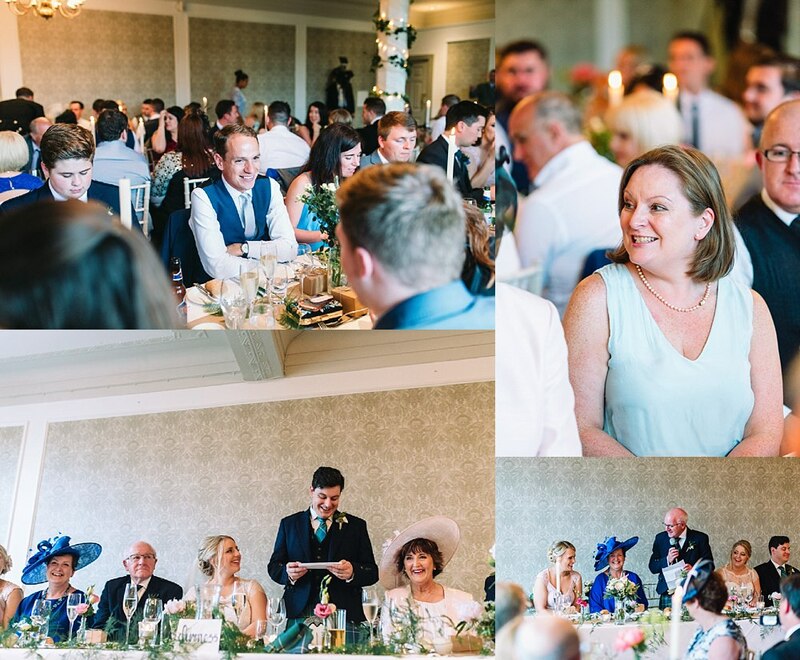 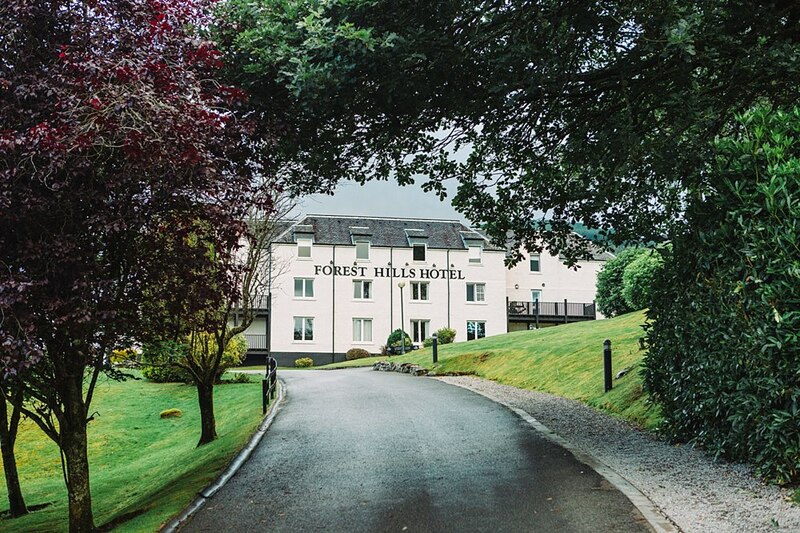 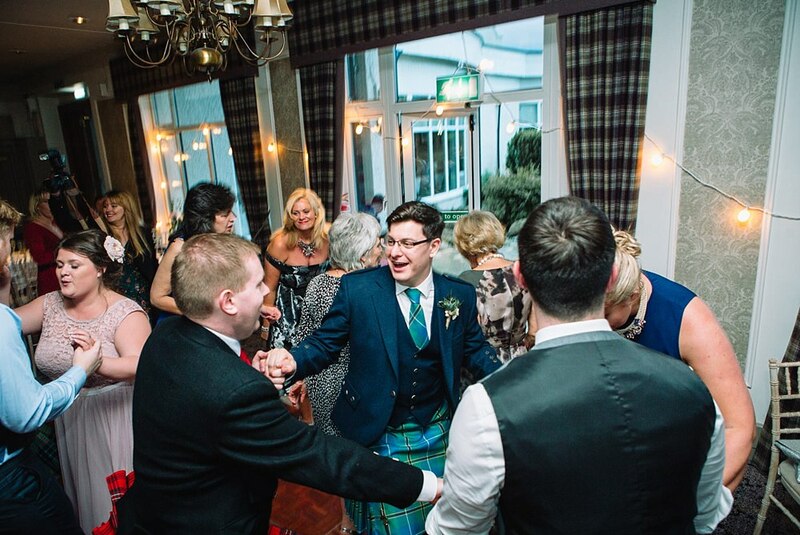 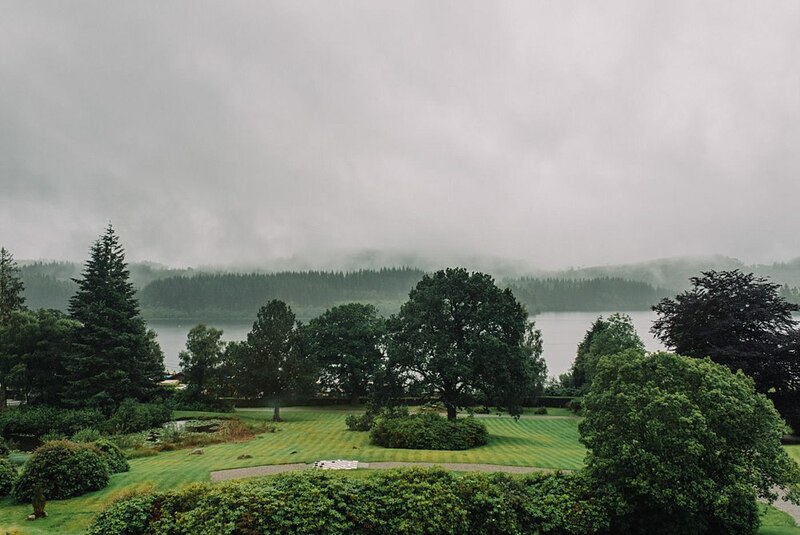 Despite the moody Scottish weather, it was a completely different story inside for the wedding breakfast. 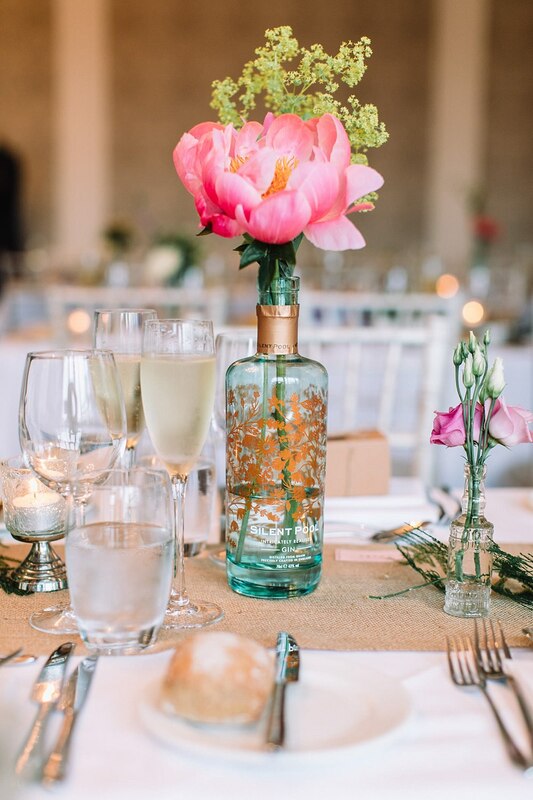 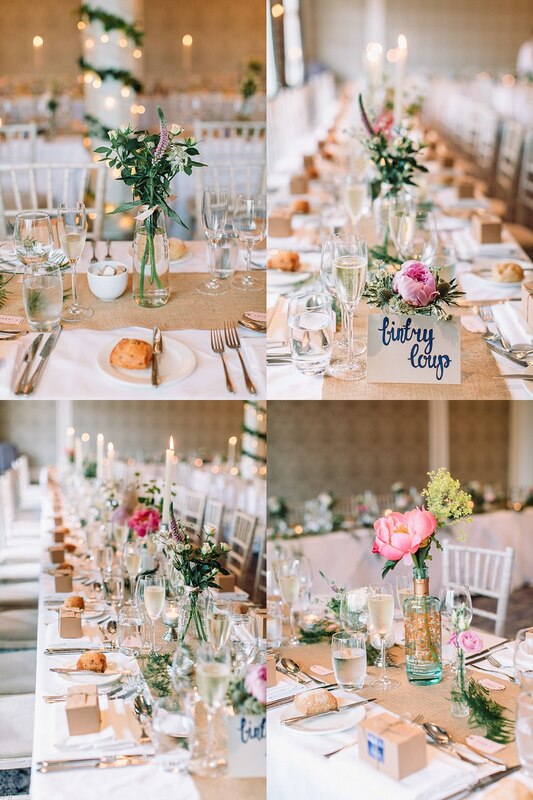 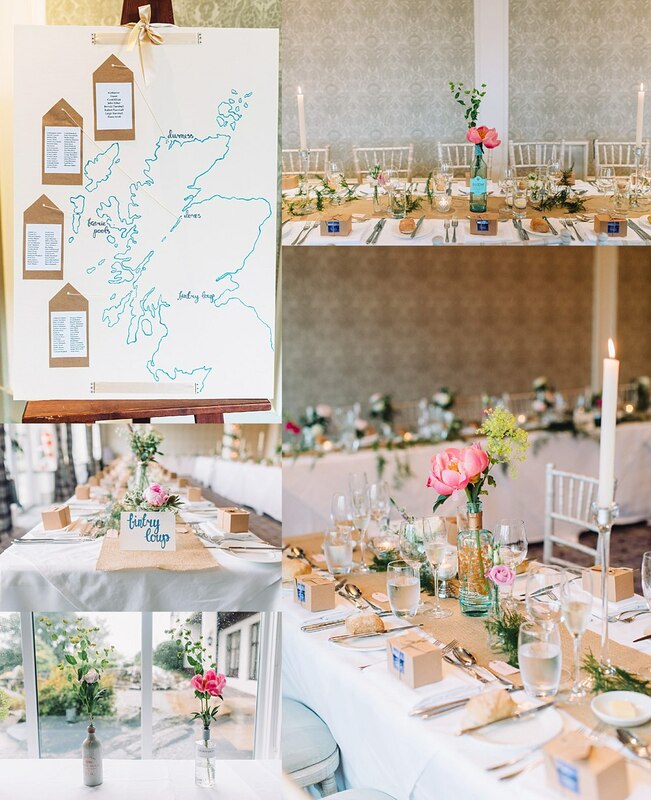 The tables were set up so light and beautiful with vibrant flowers placed in miss matched Scottish Gin bottles, hessian table runners, greenery and candles. 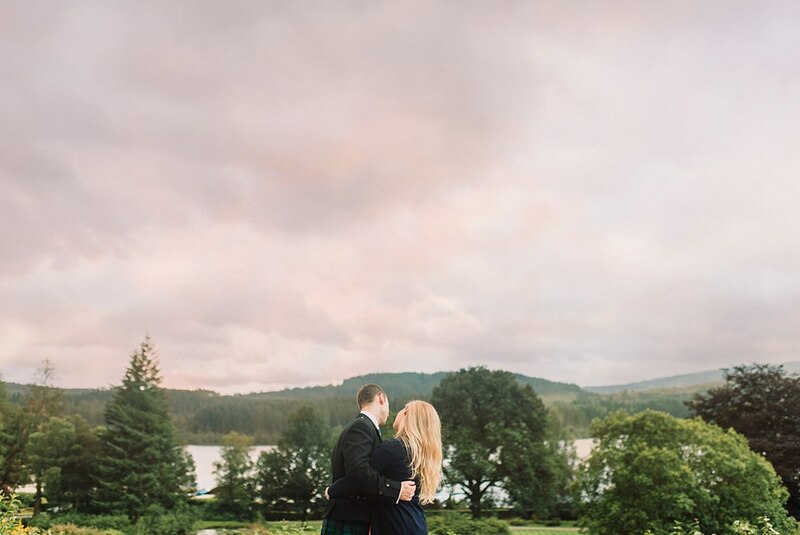 It had such a romantic and pretty look which was at the same time very Scottish and calming as well. 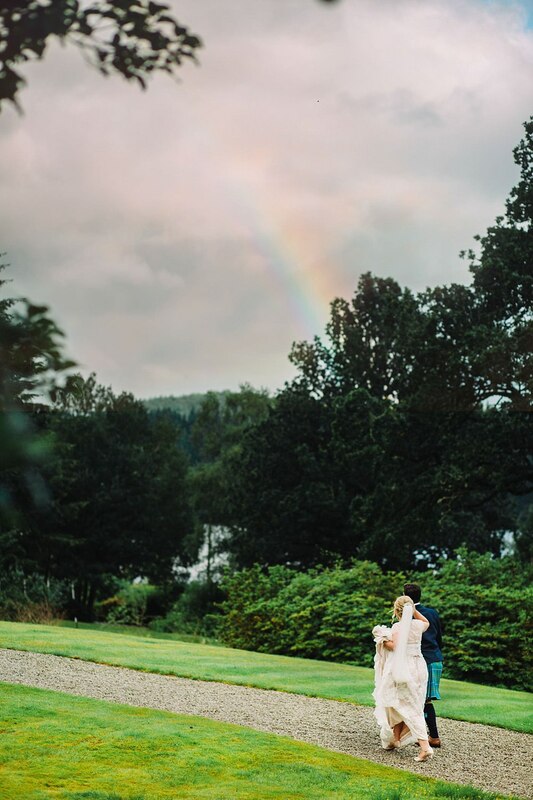 However, as the day was coming in for a close with evening festivities getting into high gear the skies cleared and we were treated to a beautiful rainbow and a pink sky while the sun was setting in the distance. 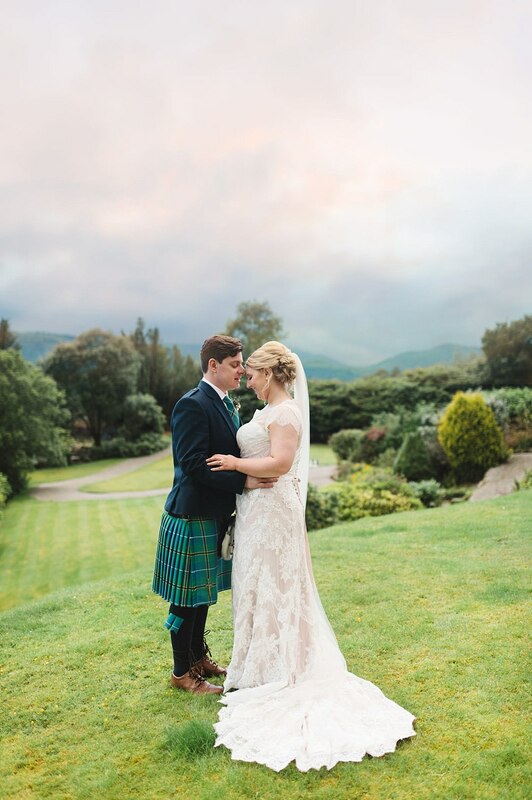 It was the perfect setting for more photos and the perfect ending to their day! 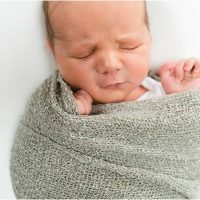 We do hope you enjoy this blog post. 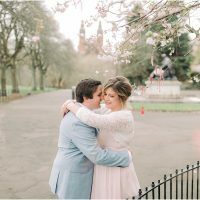 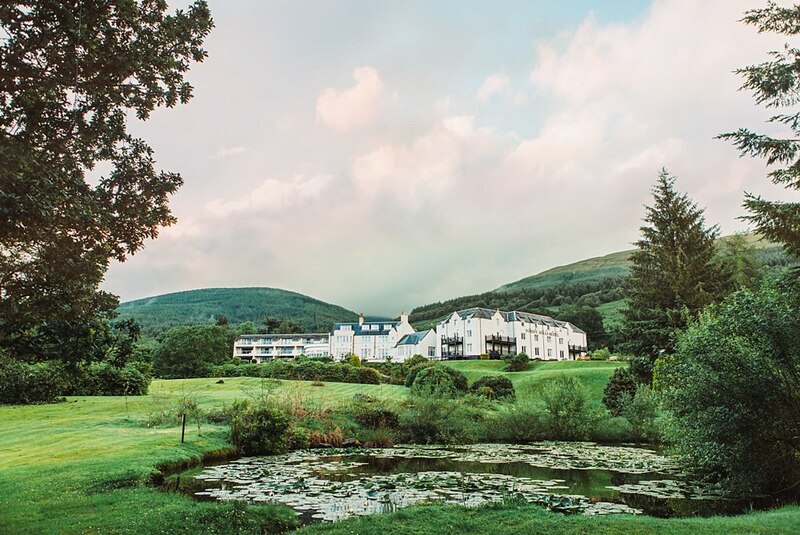 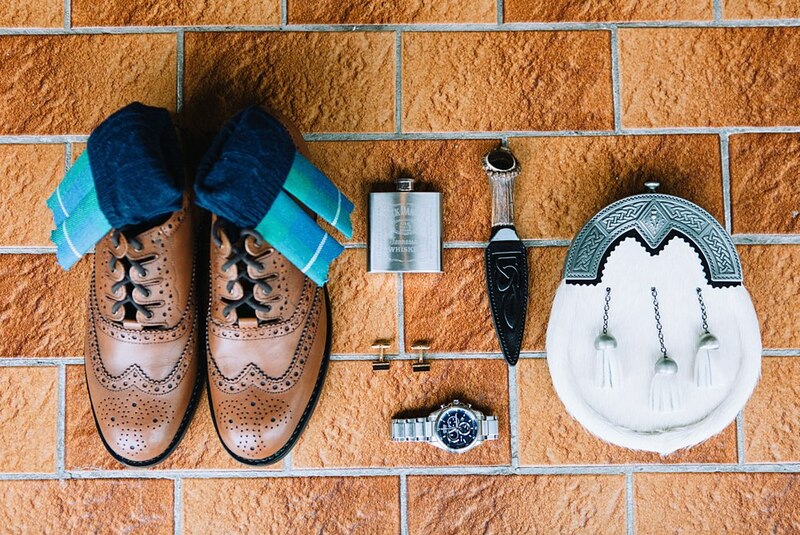 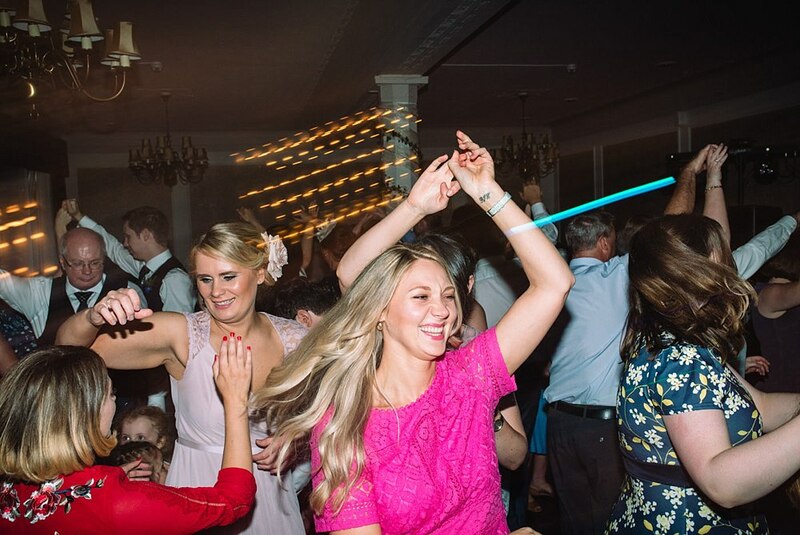 Scroll down for a list of wedding suppliers used on the day.